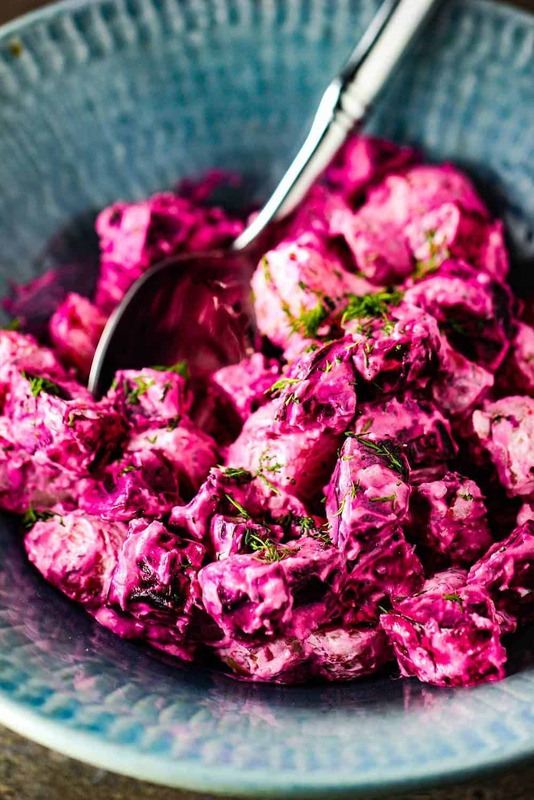 Beet and Potato Salad with Dill Dressing has become a go-to salad for us, especially during the winter months. 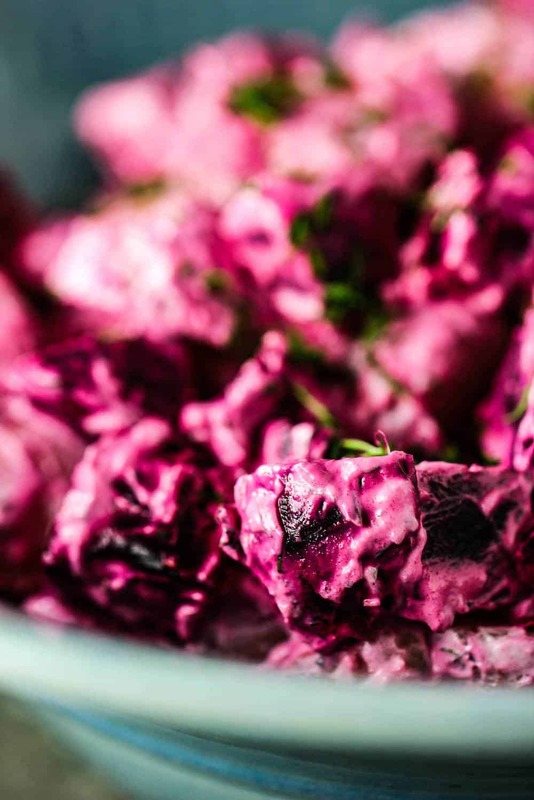 The flavor of the roasted beets pairs perfectly against the potatoes and the dill dressing is wonderful. Oh, roasted beets. You are a thing of beauty. Beets are truly amazing in how simple they are to prepare and how delicious they are to eat. 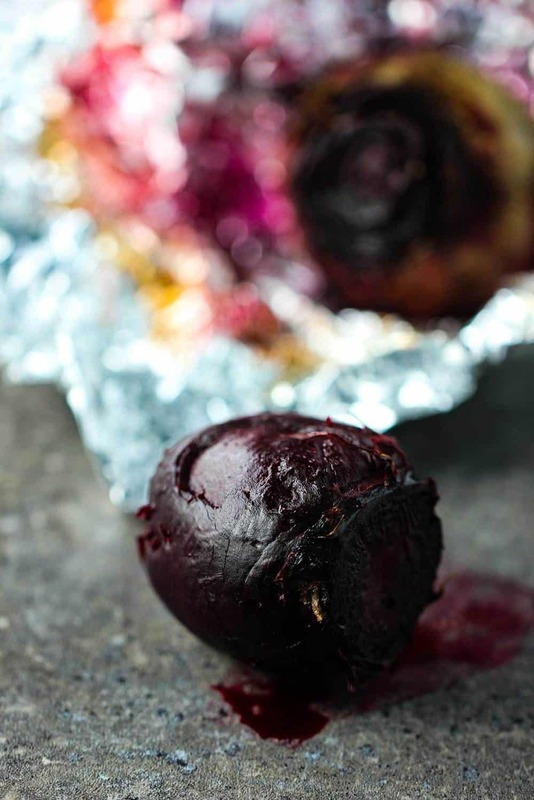 Simply wrap the beet in foil, no need to peel the skin, and just let bake for about an hour. Then let them cool briefly and see how easy it is to remove the skin and then cube. So easy and so tasty. 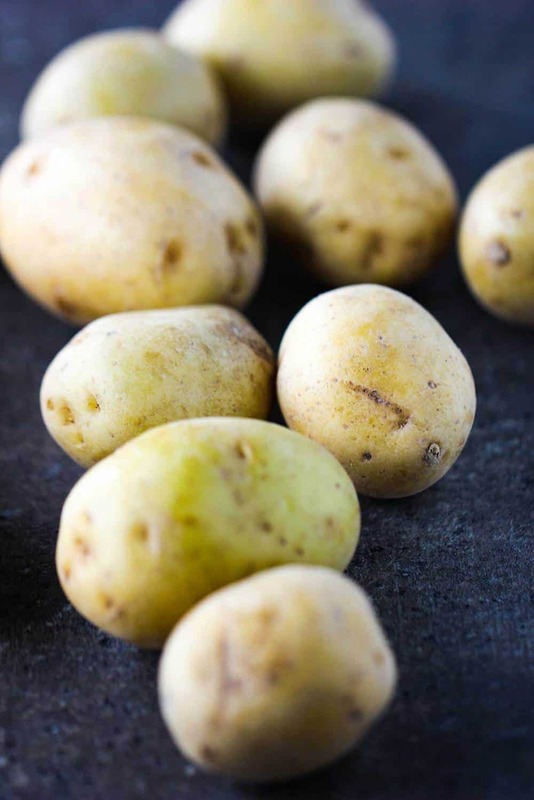 For the potatoes, look for pearl potatoes, or small Yukon gold potatoes. The size matches well with the cubed beets and the flavor and texture is perfect. Although, you may still need to cut up the potatoes after boiling, if they are too large. A quick boil cooks the potatoes to perfection. We find that peeling them isn’t necessary, but does make the dish even more attractive. Peeling after boiling we find is easiest. If you know anything about us, you know about our obsession with fresh dill. How we love you fresh dill! As you gently mix the salad together, the red beets will naturally color the salad to a gorgeous purple. We think the salad is as beautiful to look at as it is to eat. A sprinkle of chopped fresh dill is a nice contrast in color to the purple hues. When I made this for a gathering of friends, Wesley was not sure how he would feel about it (even though he loves roasted beets). After one bite, he was sold. This salad can easily be prepared in advance, for up to 24 hours. We think it tastes even better after the flavors have melded. If you are looking for a unique and delicious salad to serve on a busy weeknight, or for a wonderful gathering of loved ones, this is the perfect salad. The tastes and textures are spot on. 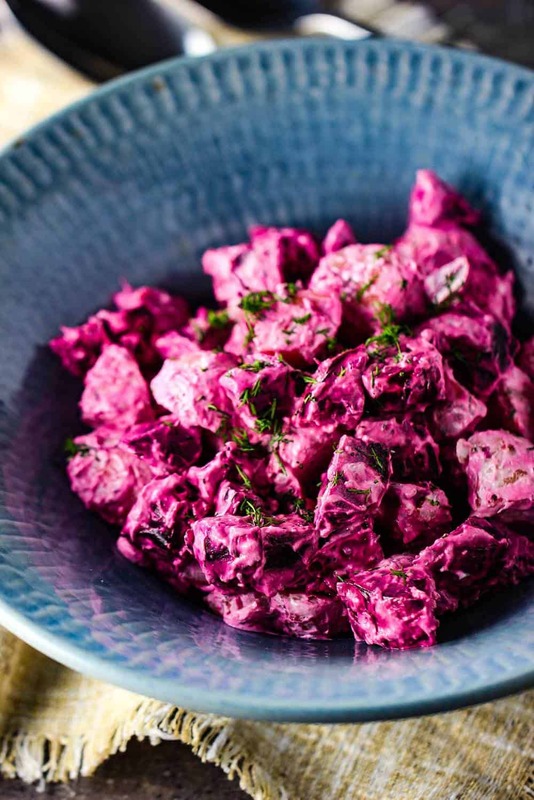 Make this Beet and Potato Salad with Dill Dressing and you will be happy that you did. 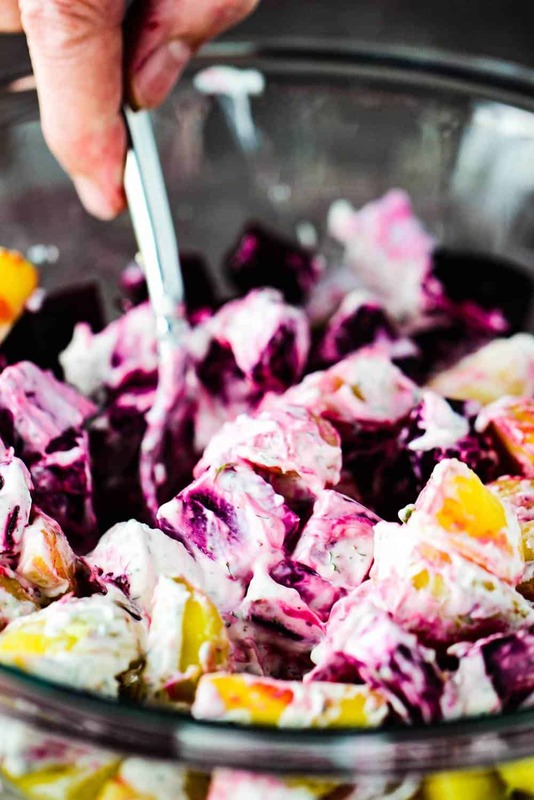 This Beet and Potato Salad with Dill Dressing is a perfect winter salad, but, honestly, it is wonderful any time of the year. Reminiscent of a good standard potato salad, you and your guests will find comfort and joy in this glorious and beautiful salad. The salad can be made up to 24 hours in advance. Trim off leafy beet tops and wrap the beets in foil and place on a baking sheet. Roast the beets in the oven for about 1 hour, or until they are easily pierced with the tip of a knife. Remove the beets from the oven and let them cool in the foil. Unwrap the foil and then peel the beets and then cut into bite-sized cubes. Meanwhile, place the potatoes in a pot with salted water, covering them by about 1 inch. Bring to a boil over high heat, then reduce the heat to medium-low, cover, and simmer until the potatoes are tender when pierced with a knife, about 15 minutes. Drain and set aside. Once cool enough to handle, peel them, if desired. If necessary, you may need to cube the larger potatoes. 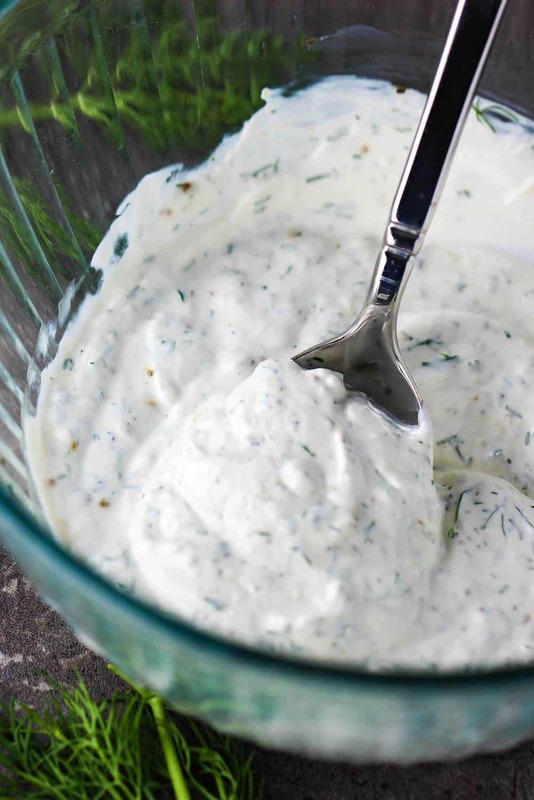 In a serving bowl, stir together the sour cream, mayonnaise, horseradish, 2 tbsp dill, and healthy pinches of salt and pepper. 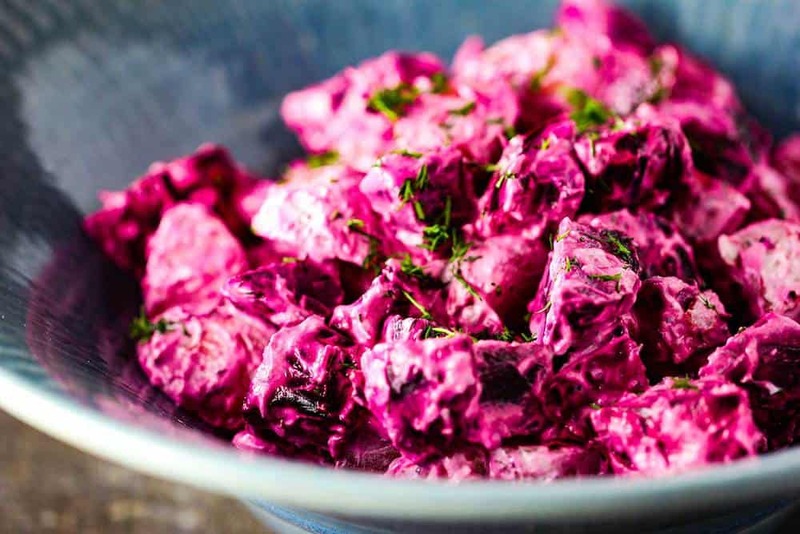 Fold the beets and potatoes into the dill dressing. 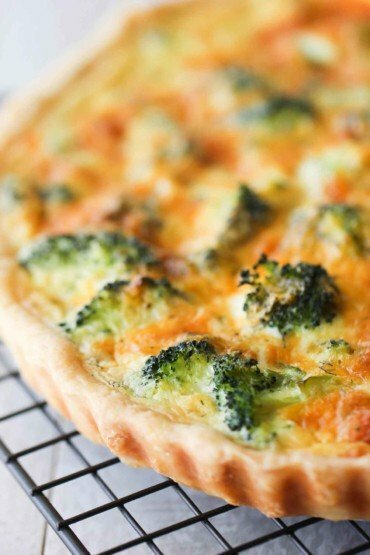 Cover and refrigerate for at least 20 minutes or up to 24 hours. When ready to serve, garnish will fresh chopped dill.